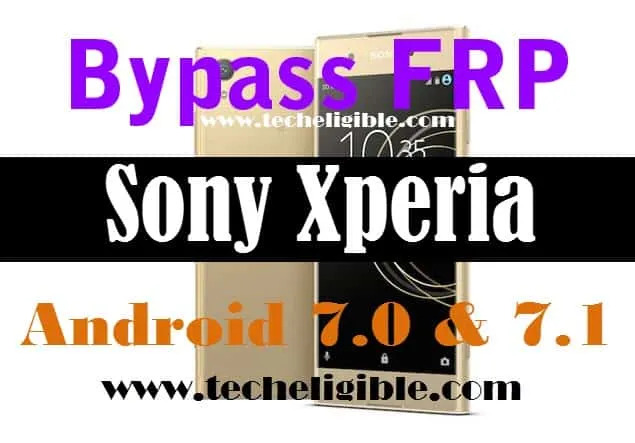 FRP Bypass Sony Xperia Android 7.0 method is for all sony xperia Android 7.0 and android 7.1 devices. ⇒ Sony Xperia XA1 (G3461), Android 7.0, Android Security Patch Level Aug 5 2017. ⇒ Sony Xperia XZ Premium (G8142), Android 7.1.1. Android Security Patch Level Sept 1 2017. You can try this method with your any Sony Xperia device. • Tap on “Get Started”, then “Accept”, and after that “Skip”. • Now tap on “Setup as new”. • Connect “Wi-Fi” to your Xperia device to finish FRP Bypass Sony Xperia Android 7.0. • Once “Wi-Fi” connected, tap on “Back Key” until you reach at “Welcome” Screen. • Tap on “Visual Aids” from welcome screen. • Now tap on “talkback”, and then turn on “Talkback” from top right corner. 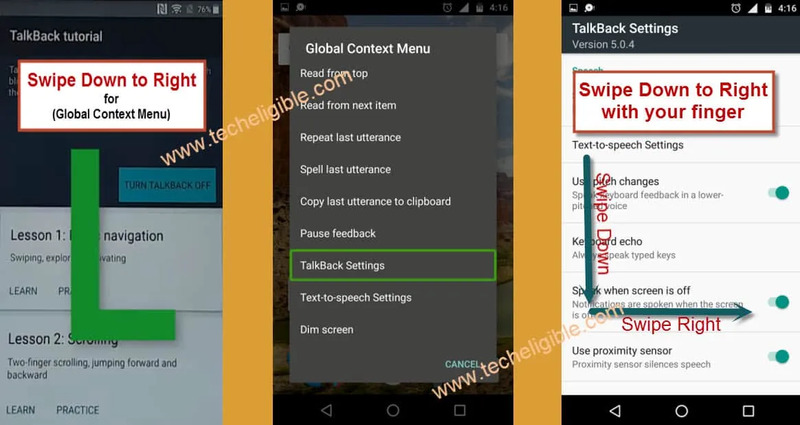 • On “Talkback Tutorial” screen, “Swipe Down to Right” with your finger to go to “Global Context Menu”. 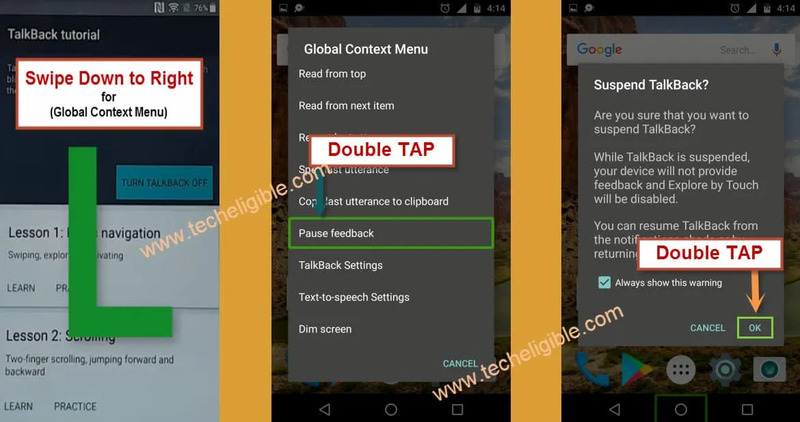 • Double Tap on “Talkback Settings”. • Now again “Swipe Down to Right” from talkback settings screen. • Double Tap on “Pause Feedback”. 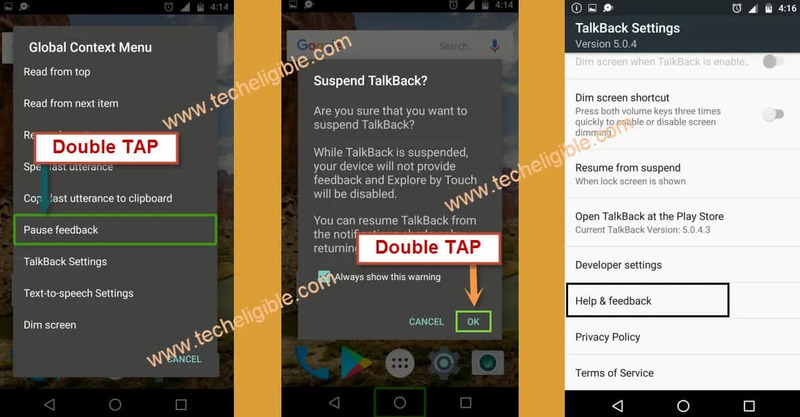 • Now Double Tap on “OK”, to suspend talkback. • Tap on “Help & feedback” from talkback settings. • Now tap on “Search icon” from top right corner. 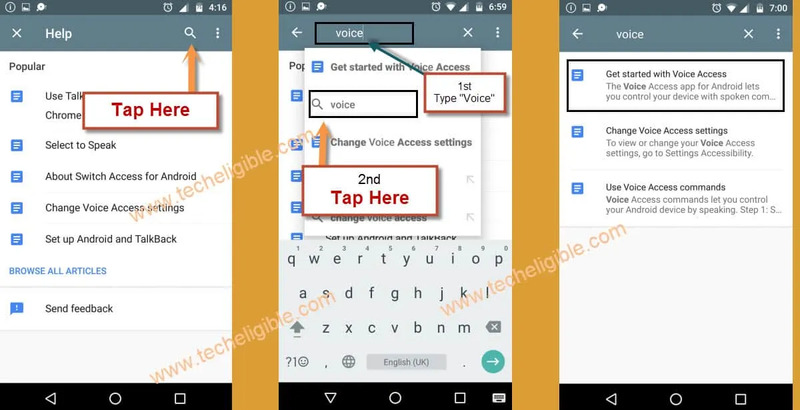 • Type there “Voice”, after that tap on “Voice” from result. 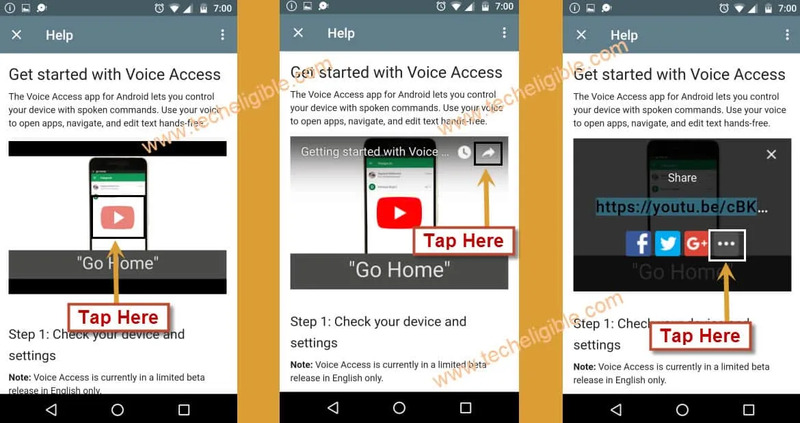 • Tap on “Get started with Voice Access”. • Tap on “Play icon” to play video. • After that tap on “Arrow” to share the video. • Now tap on ” 3 Dots”. • Drag “Youtube Video” to down. • Tap on “3 dots” from top right corner. • Now tap on “Settings”. • Tap on “Accept & Continue”, and turn off “Data Service is on” option, and then tap on “NEXT”. • Now tap on “NO THANKS”. 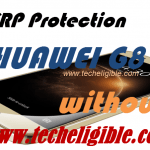 • Type in google search bar “Bypass FRP Applications and files Techeligible“. • Tap on most relevant search result as shown in below image. • Download “Quick Shortcut Maker“. • Once Downloading Finish, you will have a popup bottom of your screen, just tap on “OPEN” from there. 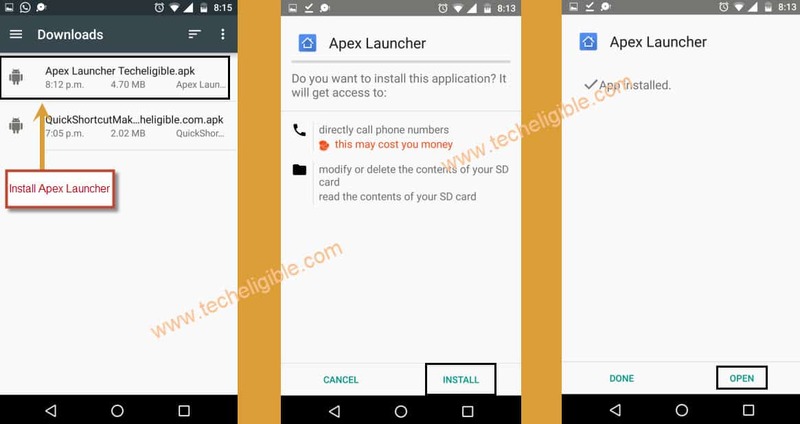 • Tap on “Apex Launcher”, then “Install”, and after that “Open”. • Tap on “MENU” to got your Xperia menu. • After that tap on “Download”. • Now tap on “Quick Shortcut Maker” to install it. • Tap on “Install”, then tap on “Open”. • Type in search bar “Core Settings”, tap on “Core Settings” to expand it. 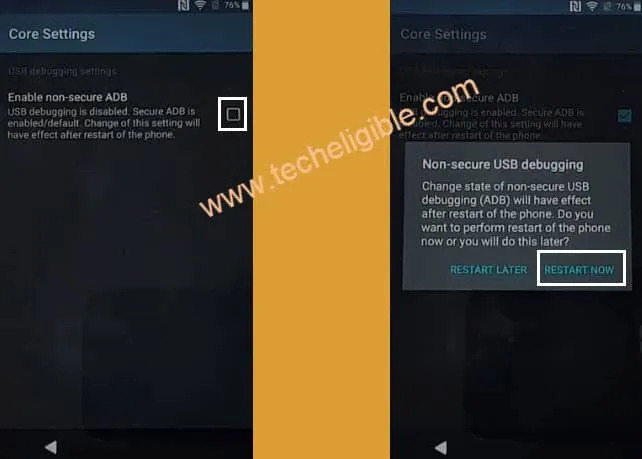 • Now tap on “Core Settings”, after that tap on “TRY”, then disable “Enable non-secure ADB”. • Tap on “Restart Later” from popup message. • Now again tap on top right corner box to enable “Enable non-secure ADB”. • Tap on “Restart Now”. • After Restarting Xperia device, you will have “Talkback Suspended” popup there, tap on “EXIT”. • Now “Swipe Down to Right” to go to “Global Context Menu”. • Double tap on “Pause feedback”, then double tap on “OK”. • From welcome screen, tap on “Get Started”, then “Accept”, and after that “SKIP”, and then “Setup as new”. • Now you will have “Verify Your Account Screen”. • Connect Your Device via Micro USB Cable to your “Desktop or Laptop”. 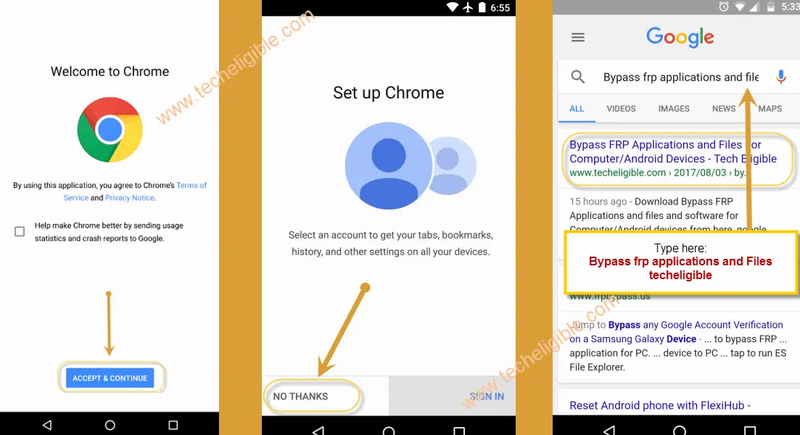 • Open google chrome, type there “Bypass FRP Tools Techeligible“, and open most relevant search result. • Download from there “ADB FRP Bypass” file in your computer. • Turn off “ANTIVIRUS” Software, because you wont be able to run “RUN.EXE” if antivirus is active. • Extract “ADB FRP Bypass” from winrar archive, and then right click on “RUN.EXE”, and run as administrator. • Once you got the message of “Press any key to continue..” in adb frp bypass screen, then press any key from your keyboard, and wait 1-2 minutes. • Remove “Micro USB Cable” from your Xperia Device. • Keep tapping on “Back Key” until you get the option “Select a home app”, from there tap on “Xperia Home” to launch your xperia device. Congrats you have done FRP Bypass Sony Xperia Android 7.0. • Tap on “Apps”, then go to “Settings”, and then tap on “Accounts & Sync”. • Tap on “Add Account”, and add your new gmail account there. Thanks for visiting us, if you are facing any issue while bypassing frp lock, feel free to ask us in comment box. ⇒ Connect Wi-Fi, tap on Visual Aids > Talkback > Turn on. 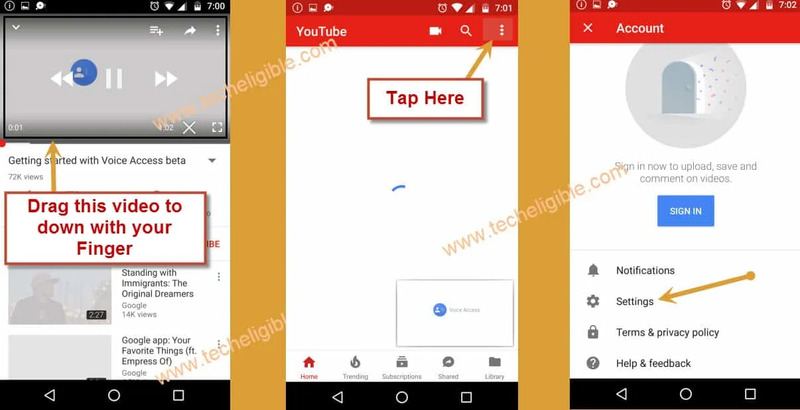 ⇒ Open Youtube, Go to Youtube Settings, then Open Google Chrome. 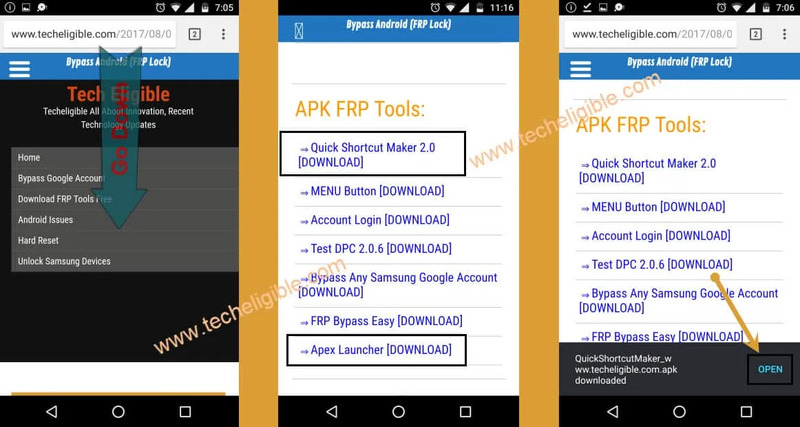 ⇒ Search “Bypass FRP Applications and files techeligible”, download “Quick Shortcut Maker” and “Apex Launcher”. 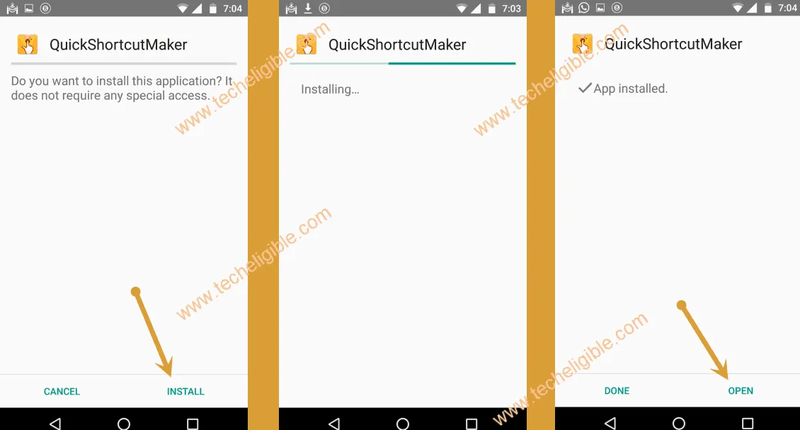 ⇒ Install “Apex Launcher”, open download folder, “Install Quick Shortcut Maker”. ⇒ Open “Core Settings”, disable “ADB” then again enable “ADB” and restart device. ⇒ Suspend “Talkback”, Download ADB FRP Bypass in your Computer, then connect device to computer via USB Cable. 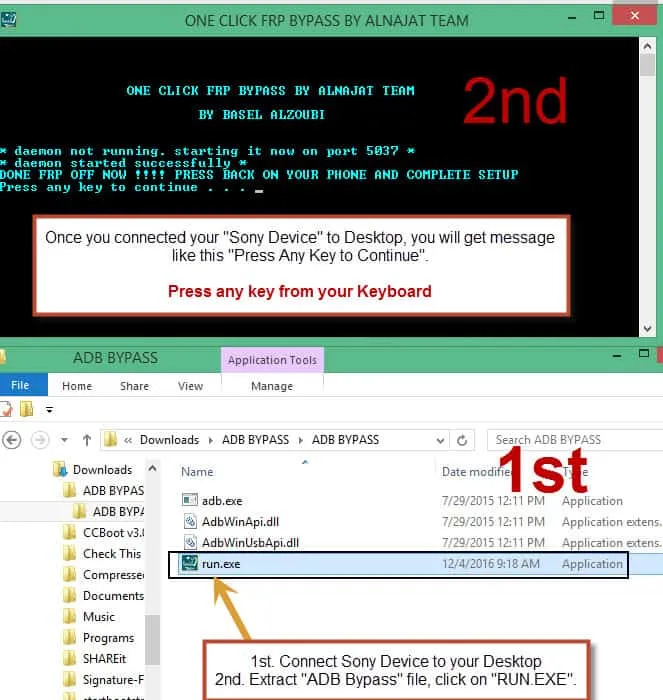 ⇒ Run.exe file from adb frp bypass folder, then remove USB Cable, and keep tapping on “Back KEY” from Xperia device. ⇒ Add new gmail account there. Thanks Guys you got the USB Debug turned on for me on my Xperia XA1 with this procedure. Then found an ADB command elsewhere on Web to finish the job. I can’t extract ADB FRP Bypass as it’s no longer there? guys you are the best. im so thankful to you. keep it up. thannk you boss,,you solved my frp problem,,yey…. Turn off your any “Active Antivirus” Software, and then download adb frp bypass again, after that you will be able to find “RUN.EXE” there. This adb frp bypass cant be run if antivirus is active, and its not harmful, just remove frp and then reactivate antivirus, that’s it. Sony XZ F8332 / Android 7.1.1 / Patch Sept. 1 2017. – Non-secure ADB is enables! Touch to disable non-secure USB debugging. Do i need to disable or enable it?